Orlando has a variety of theme park attractions that bring in millions of people every year. Universal Studios is among the theme attractions that provide a world-class entertainment, shopping, and dining experience. Many people are aware of Islands of Adventure and Universal Studios, but often forget about all of the fun that can be had in the entrance of these parks, at Universal CityWalk. Universal Orlando draws 10 million visitors each year. 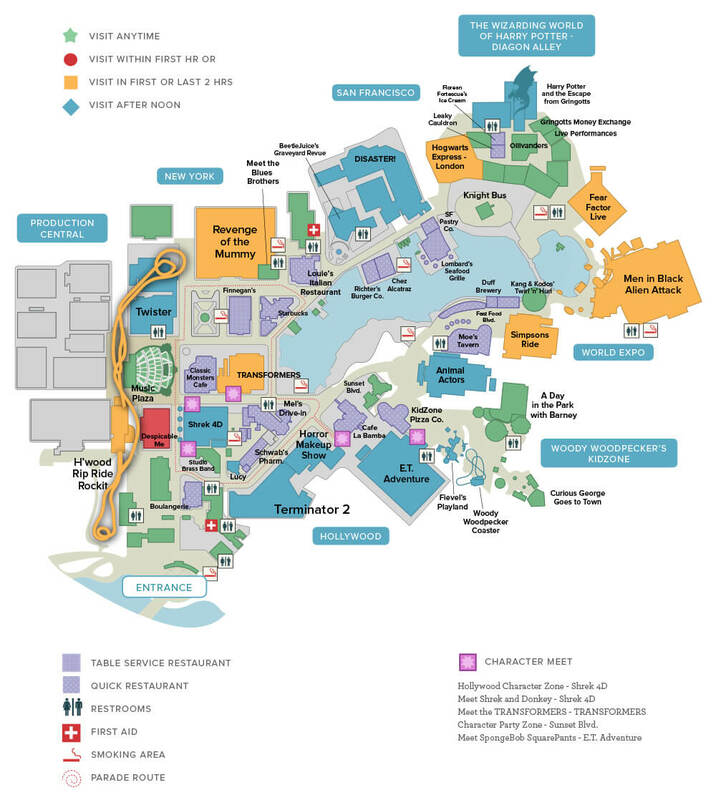 Universal Orlando sits on 108 acres, and wants to expand on an additional 450 acres. Universal Parks & Resorts, which includes Orlando, Hollywood and Japan, reported revenues of $1.4 billion for 2016 (figure reported in October, 2016). Where is Universal's City Walk? The vibrant downtown of Universal’s City Walk is located just west of the Florida's Turnpike and Interstate 4 convergence. It's exit 259 and south on I-4 one exit to S. Kirkman Road, then north to Major Blvd., go left and head two blocks west to Universal Blvd. Make a left, heading south and follow the signs to City Walk. What's in City Walk? Enough to keep the family fed, busy and entertained for days! From famous-named eateries (Jimmy Buffett's Margaritaville, Bubba Gump Shrimp Company); music venues (Rising Star, Red Coconut Club); ethnic and regional cuisine (Antojitos Mexican, Pat O'Brien's, Bob Marley-A Tribute To Freedom); shopping (books, fun and educational toys, sweets, clothes, lifestyle and home goods and of course, movie-themed and Disney memorabilia) and special events (Mardi Gras, Caribbean Carnival, Oktoberfest, Halloween, Christmas light spectaculars and New Year's Eve, City Walk entertains everyone from the very young to the old-enough-to-know-better-but-who's-watching crowd. What are the hours of operation and what about parking? City Walk, like the theme parks, is open 365 days a year. Unlike the theme parks, which close between 6 and 8 p.m., City Walk is open until 2 a.m. Parking is available in the theme parks' 18,000-vehicle main garage at 6000 Universal Blvd., and the current base parking fee is $20. A preferred parking option costs $30 and valet parking is $50. Free self-parking is available after 6 p.m.
What is the ticket price and are there special rates? Aside from the parking fees, there is no entrance fee for City Walk. The theme park prices vary, depending on whether you're a Florida or out-of-state resident, any meal plan, multi-day or multi-park admission options you choose. What's great for kids and is City Walk accessible for wheelchairs and strollers? The kids want to head right to the theme parks, but even they need a break, and City Walk is perfect for a little down time. Smaller and more kid-friendly play areas are available among the Hogwarts, Transformers and mummies, along with seating for moms and dads and plenty of restrooms. Kids and parents will also enjoy a game of mini-golf on the Hollywood Drive-In Golf course, featuring two courses and interactive scenery at every hole. Where is the best place to stay during my visit to Universal's City Walk? Jeeves Florida Rentals has the best part of your trip covered with our luxury resort homes close to City Walk and all the theme parks. Our homes offer two to 12 bedrooms and amenities including game rooms, pools, golf course and lakefront views, home theaters and gourmet eat-in kitchens. Our staff's specialty is fulfilling every need and wish, whether it's buying your favorite groceries and filling the house fridge and pantry, hiring a personal chef for a special dinner, or getting that baby stroller, BBQ grill or reservations at Orlando's best restaurants. Leave your next Orlando vacation to Jeeves, and make every day an event!